Over 600 Lazaridis School Honours Economics, Honours Bachelor of Business Administration, double degree, master’s and PhD students crossed the stage as graduates from Wilfrid Laurier University as part of Spring 2016 Convocation on June 16 and 17. Family, friends, faculty, staff and community members were in attendance to show their support and offer words of congratulations and advice. Michael Lee-Chin, chancellor of Wilfrid Laurier University, shared three ways to build a fulfilled life: do well for oneself and one’s family, do good for society and execute both with absolute passion. "Make no little plan, make big plans...aim high in hope and work," Lee-Chin urged the graduates. Nicole Coviello, marketing professor at the Lazaridis School, received the 2016 University Research Professor award for her significant contributions to the fields of international entrepreneurship and marketing. “Life is about long, ongoing, continuous learning,” said Coviello, who will use the research grant to study how innovation and marketing impact a company’s performance. Coviello borrowed from the words of marketer and Silicon Valley venture capitalist Guy Kawasaki – "Eat like a bird and poop like an elephant" – to inspire the graduates. Like birds who eat 100% of their body weight, Coviello called on the graduates to absorb as much knowledge as they can, and like elephants who produce a large amount of waste, use what you learn to make a big impact. The Lazaridis School presented honorary Doctor of Laws to renowned economist, Peter Howitt, and CEO of BMO Financial Group, Bill Downe (BBA ‘75). Both of Laurier’s latest honorary degree recipients were eager to impart their wisdom on the new graduates. "This university gave me everything I needed to accomplish anything I wanted to do," Downe told the Business graduates, explaining how the greatest accomplishments are more often characterized by bumpy road rather than a straight path. To the graduates unsure of their futures, Downe advocated: "Choose the most worthy opportunity presented to you and give it your best." Members of Wilfrid Laurier University’s Alumni Association (WLUAA) also offered their own insights as Lazaridis School alumni, having been at the same place as these latest graduates not long ago. “You didn’t just get a degree, you solidified a bond,” explained Jeff Gadway (BBA ‘07), director of product marketing at Vidyard. Gadway reassured the Lazaridis School graduates that they don’t need to know everything right now and provided some advice he wished he had been told: "Work will always be there…when you figure out what you care about, throw yourself at it entirely." Mark Aiello (BA ‘02), senior vice president, strategy and operations at Marsh Canada Limited explained how the university’s emblem, a maple leaf, not only serves as a Canadian symbol but a microcosm of how the many facets of the Laurier community come together as one. “Wear a piece of Wilfrid Laurier University wherever you go,” Aiello said. 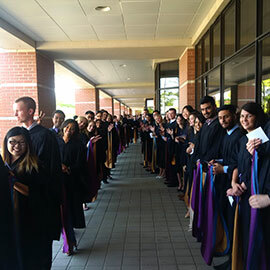 Congratulations to the Lazaridis School class of 2016…Welcome to the Laurier alumni family!